JE is a Canadian television programme (in French, with English subtitles) and this edition is a follow-up to an earlier report examining the Church of Scientology in that Country. It focusses on ‘Applied Scholastics’, a Scientology front group which has elaborated L Ron Hubbard’s incredibly simplistic writings about learning into an ‘educational’ system – complete with fee-paying schools. One of Hubbard’s ideas is that failure to progress academically is due to the student having “misunderstood words”. He claimed that, if a student moves on after having misunderstood a word, they would not be able to understand anything they were taught after that point. This is addressed by requiring students to look up all the words in their teaching material in a dictionary until the student thoroughly understands them all. There are no poor textbooks nor bad teaching in Scientology schools – only misunderstood words. View the programme in a video window after the break. 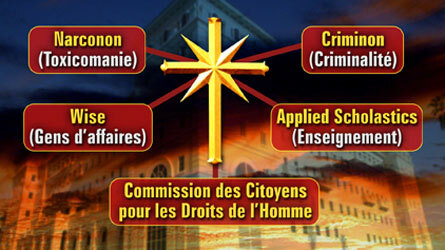 The programme continues to clearly show the connections between Applied Scholastics and a small network of other Scientology front groups.These include the ‘Citizens Commission on Human Rights’ (CCHR). The CCHR denies the very existence of psychiatric disorders (and asserts that they can all be ‘handled’ by Scientology training). It characterises psychiatry as an evil conspiracy, not a caring profession. 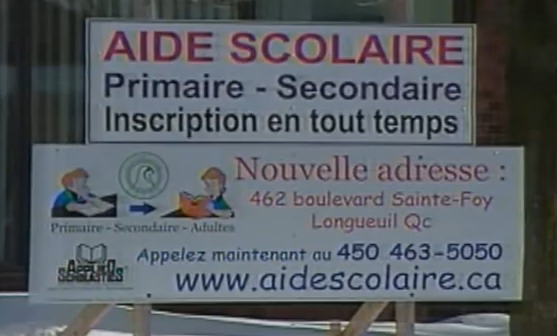 The programme closes with the revelation that the Scientology school Académie Phénix (for such it is) has been granted charitable status in parts of Canada. As the school pays franchise fees to another Scientology front group (for the use Applied Scholastics ‘technology’ and material) the money saved eventually makes its way to the Church of Scientology. I have a few comments. There is more to study tech than misunderstood words. Study tech doesn’t require you to look up all the words in your materials. LRH recognized that the study materials themselves could be at fault — that a valid textbook was necessary. LRH didn’t say that MUs were the cause of ADD – an individual Scientologist said that. That was his opinion. I think most folks both in and out of Scientology who don’t accept the “imbalance in the brain” theory recognize that the symptoms of ADD can be caused by boredom, insufficient exercise, food additives, poor diet and many other things depending on the child. Many medical professionals have questioned the idea that ADD is an identifiable illness or condition, in other words, a condition with a specific cause that requires one specific handling, as opposed to a complex of symptoms that can be caused by various things, none of which is cured by Ritalin. As far as psychiatry being a caring profession, I’m sure there are some individuals in it who are caring professionals, but it is also the profession that uses electroshock and harmful drugs and is sometimes forced on people — or their children — by the courts. Psychiatrists do have a regrettable tendency to label a group of symptoms as an illness and sometimes with very little observation, and then attempt to handle it with a drug. I agree that it was an individual Church of Scientology member who made the claim about ADD, and this does not, in itself, invalidate Hubbard’s writing. However, it seems to me that the ‘misunderstood word’ idea was adopted by Hubbard precisely to quash dissent. Many Scientology texts include a prominent note issuing a dire warning not to ‘go past a word that you do not understand’. Also, Hubbard has stated that Scientology always works when properly applied. If you accept these two ideas any failure (or questioning of doctrine) can only logically be interpreted as due to a misunderstood word. Besides – where did Hubbard expect anyone to acquire a “valid textbook” about Scientology? As ‘source’ he was (and still is) the only person whose writing on the subject is considered canonical. Consequently, the only ‘textbooks’ about Scientology are his own. Regarding alternative causes for ADD. Scientific medicine is by no means perfect, but proper, peer reviewed, double blind trials identify ADD as a real condition – and a competent diagnostician will rule out all of the alternative causes which you suggest before coming to a conclusion. People believe many things – but belief does make them true. Of course, doctors and researchers do not always agree. However, this is not a flaw. Diversity and internal debate are a great strength. They ensure that the medical profession constantly re-examines old ideas and originates new ones. In this way, new theories and treatments emerge, and ineffective ones can be identified and discarded. Contrast this with Scientology. The policy regarding ‘verbal tech’ prohibits any internal debate, and Hubbard’s writings are considered to be the last word on any subject he has discussed. Consequently, no aspect of Scientology theory> has changed since his death (or, to put it another way, no progress has been made). Regarding psychiatry – I find it interesting that you condemn this profession for it’s use of electroshock and ‘harmful drugs’. Hubbard’s attacks targeted lobotomy and electroshock. Today, drugs seem to have been substituted for lobotomy because psycho-surgery fell out of favour long ago, and is never performed today for psychiatric illnesses. What’s more, electroshock is only used as a rare last resort – and now includes the use of muscle relaxants which eliminate the convulsions which used to accompany this treatment. Also, I find the use of the term ‘harmful drugs’ odd. It’s rather like asking, ‘when did you stop beating your wife’. By definition, no doctor would administer a harmful drug because its… well… harmful. Doctors administer medicines. Some have side effects, which are potentially harmful, but any good clinician is aware of what they are and takes pains to minimise their effects. Medicinal drugs are only used when the alternative is worse that the side effects. Which would you rather suffer – these side effects from antidepressants or mental anguish and a pointless death by suicide? As for forcing treatment on people – in the UK (which is the only country I know about) only those who are a danger to themselves or others by reason of mental illness can be taken to a place of safety against their will (and then only in pursuance of a court order). They are given minimal treatment. The alternative is often to allow them to harm themselves or others when they are not in their right mind. Should we allow someone with paranoid delusions to kill himself on the street to escape imagined persecutors, or protect them, and try to treat their illness? This is not an academic question. I know a psychiatric nurse, and I assure you that he is a caring, compassionate and professional individual who has helped many people through terrible crises and enabled them to resume productive lives. I base my opinion of psychiatry partly on his behaviour and that of his colleagues, and the good they have done. May I ask what actual experience you have of the profession? scricrit: YES! everything you said is exactly correct. In the USA, we have very scrutinized Medical care. I wish there were more people examined by Psychiatrists to perhaps prevent some the violence in this country. Nothing is perfect, of course. But the baloney that the Scientologists are forced fed and digested amounts to plain old non science. They are dangerous due to the Scientologist wanting no Psychiatric help to anyone. Including veterans, and depressed, people. My latest post is about a radio programme about the activities of “Volunteer Ministers” in England and elsewhere (streaming audio and download included). This programme includes undercover recordings of a CCHR public meeting in which a number of Scientologists state that an important mission of VMs is to keep disaster victims ‘out of the hands of the Psychs’. Their ideas about Psychiatry are mired back in the 50’s (one of people who represented the Church of Scientology at the end of the programme banged on about lobotomy despite the fact that psycho-surgery has not been performed in this country for decades). They are also well-rehearsed – you hear the same debating points again and again (especially the straw man, ‘chemical imbalances’ argument). In this programme, the spokespeople came over as ridiculous fanatics. At the end, they descended to a personal attack against one of the people who argued against them when their familiar prepared arguments simply didn’t work. I suspect that Scientology persists with this approach because it works with others (e.g. conspiracy theorists) who know nothing about Psychiatry, but have already made up their mind against it for ideological reasons. They appeal to prejudice not reason, and it works for them because their aim is recruitment, not rational argument. My mother was a victim of electroshock. It did her a lot of harm in terms of her willingness to communicate, her level of rationality and memory. The muscle relaxants may prevent damage due to convulsions but they can’t prevent the damage to memory caused by the shock itself. My daughter went to an Applied Scholastics grade school. She never became a Scientologist and I am no longer one, but she credits the school with the preparation that enabled her to succeed in a public high school and in the degree in Merchandising and Marketing she got later. Naturally the books, policies and technical bulletins of Scientology were written by LRH, since he was the founder and developer of Scientology (except now they’ve been changed by David Miscavige). The textbooks in Applied Scholastics schools are on ordinary school subjects and were not written by LRH. They do offer some Scientology children’s courses but most of the study is just the usual subjects. What LRH was emphasizing was to apply it exactly as written. What is the sense in trying to change it if you haven’t first tried it? At least first try applying it exactly as written. It’s not so much a matter of accepting or questioning a doctrine as it is a matter of applying a technology (at least that was true when I joined the church). Then decide for yourself if it works or not. And doesn’t it make sense that if you don’t know the meaning of a word, it would affect your understanding of the material it is in? If you were reading something and came across a word you didn’t know, wouldn’t you look it up? We’ve had different experiences that have certainly influenced our different opinions, but I do think your views on Scientology are somewhat simplistic. In the US psychiatry and psychiatric treatments are forced on people, for example when counseling is part of a court sentence, or when a child is diagnosed as ADD and his parents are told they will lose custody if they don’t treat him with drugs. Sure there are caring psychiatrists but the methods and approaches of the profession as a whole, I feel, are less than admirable. Regarding “harmful drugs” anti-depressants can cause suicide and violence. Doctors do prescribe harmful drugs for many reasons, for example because the pharmaceutical company convinced them the drugs were safe or the benefits outweighed the problems. Or because they feel the drugs may help and they don’t have time to do more than prescribe. Anyway, Scicrit, I wish you the best in your journey through life. My mother was also treated for severe depression with electroshock back in the stone age of psychiatry. She recovered, and never suffered from the condition again during a long life. The people who administered this treatment were not sadists. They did the best that they could to treat a debilitating condition with the tools that they had. This period of psychiatry’s history can be compared to the early days of surgery – before anaesthetic or antibiotics. Surgical techniques had a poor success rate – but they were better than the alternative (which was usually death). Over the years, surgeons have learned from their failures, and from evidence-based research. Operations that would once have killed almost all patients are now routinely successful. Operations that would one have been miraculous (heart transplants and micro-surgery) have good outcomes. I can’t usefully comment on the situation in the US (being English)… so I won’t. As for the UK – treatments like electroshock and psych-surgery are incredibly rare today. They are no longer necessary because medicinal drugs are orders of magnitude more effective. Side effects exist – but they are side effects – rare anomalies that were uncovered during research and made known. If you read the leaflet that comes with simple over-the-counter headache tablets, they read “may cause headaches”. This is incredibly rare (if it wasn’t, nobody would buy them). If you are one of the people who experience this side effect, the solution is simply to try a different medicine. Some of the side effects that come with psychiatric medication are more pronounced – but they are worth enduring when the alternative is the terrible mental anguish that accompanies conditions like schizophrenia or severe depression. Also doctors are aware of what they are, and will juggle medication for the best effect. Properly administered, antidepressants don’t cause suicide or violence. Depression does. For every person who loses the battle against this condition many more are restored to productive life. Drug companies are far from perfect, but to claim that psychiatrists are routinely treating serious conditions with drugs that makes matters worse is to stray into the conspiracy theory – after all, we now live in a world where politicians can’t get away with adultery. I’m glad to hear that you daughter has done so well. However, I have to say that I find the idea of applying textbooks “exactly as written” disturbing. I have come across many textbooks whose conclusions are questionable – and sometimes just plain wrong. I received extra marks in an exam once, for pointing out that there was a mistake in the question which made it impossible to answer. Education is not about reproducing what is in books – especially higher education where the books you study express different (and incompatible) points of view. It is about learning to fairly and reasonably assess evidence and argument to come to your own view. Of course I look up words all the time. People have done this since dictionaries were invented – it is not a great discovery. Also, from what I have seen and heard, the Church of Scientology does not allow any questioning at all, and independent Scientologists consider Hubbard’s word to be final- any questionable statements are attributed to Miscavige having corrupted the text. Consequently, Scientology has not changed at all since the 50’s. This means that it is either infallible, and there is nothing new to learn (which would make the world very boring) or Scientology has made no progress since Hubbard’s death, and is becoming increasingly dated. There is a simple solution to this. If Scientologists subjected their claims to fair (double-blind, peer-reviewed, openly published) scientific examination the matter could be settled. For example, ‘touch assists’ could be fairly assessed in this way, and I for one would be fascinated to read the results of such a project. Positive results would certainly motivate me to examine this practice far more closely. I hope I don’t come over as argumentative. This is my honest opinion, and I have been taught that expressing it directly to another is a sign of respect, not hostility – a sign that I am taking your comments seriously. I am, in fact, delighted that you will engage with me (the only responses I have managed to get from members of the Church of Scientology are irrelevant one-liners or daft questions like “when did you start taking drugs?”). I wish you all the best, too. love your reply….I admire your intelligence. Everything you say is applicable in the U.S.A.
Scicrit, maybe I am willing to engage with you because I am no longer a member of the official church of Scientology. But actually, I think we can leave it at this. I do think LRH has a lot to offer and that psychiatry can be very destructive. Your opinions are different, so be it. I do have one question. Do you have a religious philosophy or spiritual practice? There are limits to what you can gain from criticizing a practice you disagree with. I feel I need to limit my time on Facebook and responding to blogs because it takes time away from positive study of what I find helpful. Right now I’m studying Eckhart Tolle and reading up on early Christianity and the Gnostics. That’s one advantage to not being in the official church anymore — reading about early Christianity would be okay but I’m not sure that studying Eckhart Tolle would go over too well. I have a philosophy, and I will try to lay it out here. First off – it will help if you understand that I admire the early members of The Royal Society (now recognised as the worlds oldest scientific academy). Their motto was “Nullius in Verba” (take nobody’s word for it) and their curiosity knew no bounds. I would describe myself as they did – as a ‘Natural Philosopher’. It’s a proud heritage – their approach (along with their energy and rigorous, rational examination of the world around us) established a scientific method which has enabled humanity to perform miracles like sending a brave little robot 4 billion miles to land on a comet. Not bad for a hairless ape. The nearest I can come in conventional terms is to describe my beliefs is ‘rational humanist’. Unfortunately, both of these term requires a lot of unpacking, so please bear with me – it all comes together in the end. The rational part embraces the scientific method as a means of acquiring reliable information about the world around us. However, I think it is worth pointing out that this practice is widely misunderstood. People will talk of Science ‘proving’ a theory. As a philosopher called Karl Popper pointed out, science cannot prove any theory, because it cannot test it in every possible circumstance. Instead, Scientists try to disprove their theories. This seems strange, but it makes sense. If you succeed in disproving a theory, you know that you need a new new, and progress. If you fail, you can place greater confidence in the theory that you have. As a result of this process we have many theories of great explanatory power (not to mention some cool technology that makes life a lot longer and more fulfilling). This idea requires that you abandon the possibility of certainty. All human knowledge is tentative, and subject to change. Humility is built in. As for Humanism, we are social animals who are at their best when we co-operate and allow our empathy and compassion to rule our actions. For an example of co-operation, I point again to the achievement of sending a probe 4 billion miles to land on a tiny chunk of rock and ice so that we can learn more about the origins of life and the universe. For an example of compassion, I point to the people who voluntarily risk their lives to bring supplies to the innocent victims of armed conflicts between fanatics. You may reply that this combination is not a “religion” or a “spiritual practice” however, as you can see from what I have written so far, I have a special problem with religion. For example: the Christian fundamentalist will tell you that the bible is the directly inspired word of God. How do they know? Because it’s in the bible which is the directly inspired word of God… A classic circular argument. There is no way, even in principle, to test this idea. You either uncritically accept it, or you do not. Scientology provides another, closely similar, example. Hubbard explicitly wrote many times that the ‘technology’ of Scientology always works when properly applied. If you accept this, Scientology can never be disproved – even in principle. Whenever it seems to fail, this is always the practitioners fault. This is a characteristic of religions. They have to be accepted on faith, without asking for evidence, nor critically examining their claims. Consequently, it impossible to make a rational choice between the almost infinite number of possible faiths (including many that once dominated whole civilisations, but have now died out). You can, by definition, only ever make an arbitrary choice between faiths – and can never properly assess the fundamental truth of what you believe, Therefore, the odds of your choosing a true belief among the many contradictory faiths which are available are massively against you. It is my observation that most people accept a religion because they enjoy the company of the people who follow it, and need the comfort of illusory certainties – especially the universal assurance that death is not the end. This is not a rational process, but a social-psychological one. There is also a serious problem when people believe that they have the absolute truth – is potentially dangerous. One consequence of this kind of attitude is the ‘crime’ of blasphemy. In many nations, religions require absolute respect for their beliefs while, at the same time, reserving the right to denigrate those of others(BTW, one of the things I have enjoyed about our conservation is that we can agree to differ, and I thank you for that). It is a small step from this to ‘the ends justify the means’ and the crimes against humanity committed, for example, by the fanatics who have hijacked Islam. I’m not sure what you mean by ‘spiritual practice’ – or how this differs from a private religious belief. I can only say that I have never experienced, and seriously doubt, the existence of a ‘supernatural’ world. For better or worse this is the only world we have, or will ever have and we find meaning in it and treat each other well while we are here. If there are no gods, then you will be gone, but will have lived a noble life that will live on in the memories of your loved ones. Incidentally, my parents were both members of the Church of England – my father was, in fact, a lay preacher. I did not rebel against this upbringing, and was never put under any pressure to believe. I simply could not take any supernatural belief seriously, for a moment, for as long as I remember. What I have written above represents my conclusions after a lifelong search for meaning – and I consider it every bit as valid as any religious or spiritual quest. I hope you can now see where I am coming from when I criticise Scientology. As you probably do, I condemn the abuses of the Church of Scientology. However, I not wish to denigrate anyone’s beliefs. Rather, I am trying to understand how they arrived at them. I cannot understand how anyone can embrace beliefs like Scientology because (to me) they are full of contradictions and failed promises(e.g. Hubbard’s claims in Dianetics to enable readers to raise their IQs, develop a perfect memory and even grow new teeth). This blog is an attempt to both oppose the abuses of the Church, and understand the mindset of honest believers like yourself. Finally, I had many (friendly) discussions with my Dad, and probably know more about theology that many Christians (an odd position for someone who would be described by them as an atheist). I hope you enjoy your reading of Tolle and recommend the books of Bart D Ehrman for many scholarly accounts of the lost gospels of early Christianity. I have added Bart D Ehrman to my favorites to peruse later — I am very interested in the lost gospels of Christianity. One thing I just want to comment looking at your earlier post, it hasn’t been my experience that in Applied Scholastic schools the students are expected not to question their texts. You seemed to think they couldn’t question their history texts, etc. but that was not the case in the school my daughter went to. By spiritual practice I mean a broad range from Catholic communion to study of the Tao Te Ching and more — just about anything a person might do to gain a greater understanding of the spiritual side of life. Gosh, I don’t remember that thing about growing new teeth! Also, I can’t give you exact references because I don’t have a lot of LRH materials in front of me, but LRH has written that he wanted Scientologists to question and see if something was true as they compared it to the real world and their experience. He didn’t expect students to accept something just because he said so — that is more David Miscavige’s position. Regarding schools, once again I can only speak for the UK. We have one or two Church of Scientology schools (and this is what they are – no mainstream school uses Applied Scholastics). Like all Schools, Schools here, Scientology schools are regulated and inspected. To exist at all they have to satisfy a national curriculum and professional teaching standards that come from outside Scientology. These require the school to encourage pupils to question and discuss teaching materials in order to to demonstrate their understanding. Whether this would still be the case if Scientology schools did not have to submit to outside inspection is, I think, open to question. Incidentally, the ‘grades’ that all schools receive after inspections are a matter of public record here. Scientology schools show unexceptional exam results. This is curious, as would expect them to be superior, if Applied Scholastics was as effective as they claim it to be. More worrying is the fact that many pupils enter the Sea Org. Since this does not happen in mainstream schools (at all, ever) I can only conclude that Scientology schools are used as recruiting grounds – and I think we might both agree that the present Sea Org is not a desirable career option. Regarding spiritual practices’… I own two translations of the Tao Te Ching – but get much more out of the Mediations of Marcus Aurelius. So it goes. And I just want to add, thanks for telling me about Bart Ehrman. I see that his work is admired by Elaine Pagels who is one of my very favorite authors. Looks interesting – thank you. I will take a look when my ‘unread books’ stack is a bit shorter. Keep up your genus ! I really dig what you say and think.